*For the one mandatory entry, comment on this post, answering the question below in the Rafflecopter form. *There are loads of other ways to enter, too – check them out on the form below! I love to go to dinner with my family and eat my mom's devil's food chocolate cake! Awesome giveaway! And congratulations on two years...happy anniversary!!! :) On my birthday (the actual day) I usually do something with my husband. The weekend before or after I'll go to my parents' house for a home-cooked meal of my choosing with the entire family. And then dinner/out one night with friends. Plus another dinner out with my in-laws. It's always a fun week! My birthday is actually next weekend! :) We usually go to my favorite Italian restaurant here for my birthday, but we have been there the past 2 weekends in a row so I doubt I will want to go again next weekend, lol! You had me totally with the salted caramel frosting!!! I want to eat that by the spoonfuls for sure!!! And then eat more with the yummy cupcakes:-) Congrats on 2 years and how far you have come!!! Happy blogaversary!!! Those cupcakes do look like little bites of heaven!!! Wow, those cupcakes look so tasty! Congrats on two years - very exciting. I have a big sweet tooth so I always like to celebrate my birthday with a fabulous cake, cupcakes, ice cream cake, or other special dessert. The rest of my plans vary year to year, but something sweet with candles is always a must! What a fun contest! On my birthday we try to go out to these best restaurant in our city that we haven't already been to yet. Such a fun splurge... good thing it's only once a year! Your cupcakes look amazing! Congrats on the blog b-day! My birthday is next month. I want to make my favorite meal (My Granny's famous meatloaf) and eat chocolate cake. Salivating! Since we have kids, we normally stay in. However, I like to go to the Olive Garden. I love their Black Tie Mousse Cake!! YUM! Coconut Cream Pie from Marie Callendars used to be my all time favorite pie....I haven't been able to reproduce it yet! However, my favorite dish is my mom's green bean casserole.....just green beans and a cheese sauce...to die for! Thanks for the giveaway! There used to be a wonderful restaurant in town we went to every year until it closed a few years back... The name of the restaurant was Applewoods and they served apple fritters as appetizers! They also gave me an apple spice cake for my b-day every year and I really didn't get to appreciate it until I was older... too bad because I would love to have one now. I just pick any place to go to now. We have great family and friends! I don't know if my last comment went in... but we used to go to a great restaurant every year till it closed down. Now my mom and sister usually cook something up! I love apple spice cake! Yum! 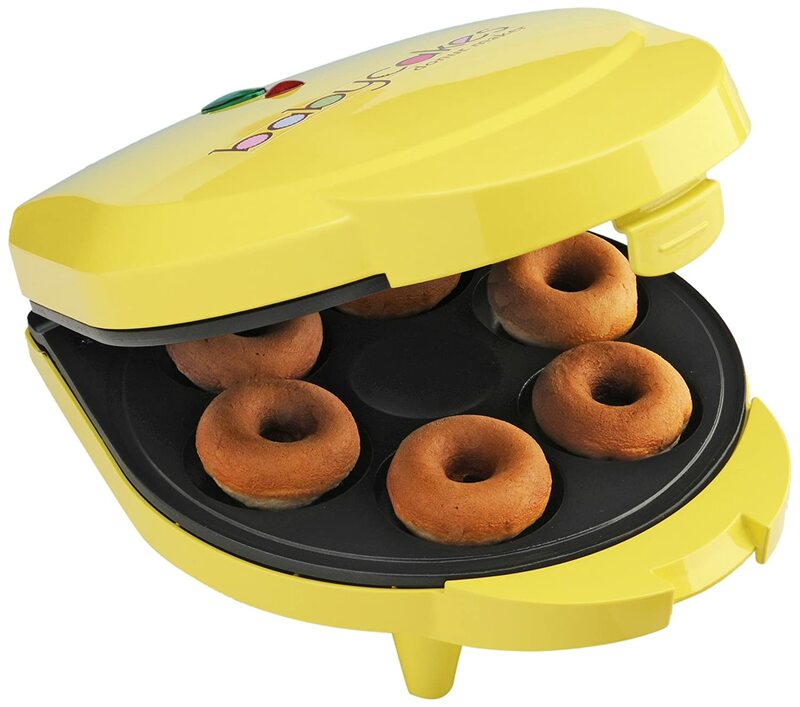 I'd love to have a donut maker. I love to celebrate at home with my husband and kids, and with a super chocolatey cake!!! Oh my goodness these look scrumptious!!! These are mouth watering delicious! Great job! My birthday is actually my daughter's birthday. She was born on my 30th birthday so I try to have her party the day before or after so that we can relax on the day of our birthday. Congrats and happy 2years! Your cupcakes look wonderful! It's just me and my kids so we usually go out to sushi (strange, I know). But it's not a birthday without cake! I stay in town and have a fabulous dinner. It's either cheesecake or some sort of chocolate cake. These cupcakes look fab. Totally pinning. These sound wonderful! I can't wait to try them! THanks for sharing at Must Try Monday, and what a fun giveaways! For my birthday, my husband takes us out to dinner usually at Macaroni Grill or wherever I choose :). we like to go out to dinner or have a fun family dinner at home!! Wow! Where does time go? I cannot believe it's been two years. I'm in awe of your cooking adventure! My birthday usually begins with lunch at yummy Mexican restaurant with my family. My birthday is right after Christmas, so I'm always impressed everybody is able to make it. The evening is often another meal out (I love eating out!) with friends and sometimes a movie. My two favorite things...dinner and a movie. Keep up the great blogging, and maybe one day I'll become a fabulous cook/baker and try even more of your fabulous recipes!! I love your blog and the recipes you share. Keep it up. I'm always looking for something new to cook for the fam. Your cupcakes look AMAZING! :) Thanks for hosting the giveaway. As for how I like to spend my birthday - My boyfriend and I go out of town each year for my birthday. We usually go to a coastal town (even though we now live in a coastal town) and spend a few days there. This year, we are going to Ft. Myers Beach. I can't wait! I've never been there before. I love cupcakes! So, I like to enjoy my birthday with my family and cupcakes. These look amazing Amy! I can't wait to make them for my friends. I love your blog, it really inspires me to cook and try different things. Oh yum, these look fabulous, and congrats on almost 2 years! Thanks for sharing at The Fun In Functional! My favorite way to celebrate my birthday is to go out for sushi. Sushi is my favorite! Amy - these look amazing!!! I saw them linked up and came over to pin them to my cupcake love board. Yum!! Yay! so glad you like these! Friends, family, and lots of cake! I'm not for the giveaway, just to tell you that these cupcakes look AMAZING !! I like to spend my birthday with my family in a low key sort of way, as long as it involves cake! Happy Blogging Anniversary!